Have you ever wondered what it would be like to have R2-D2 and C-3PO walking around your living room? Wonder no more as virtual reality startup Magic Leap is working with Lucasfilm to bring Star Wars to the real world using mixed reality, a technology that combines digital elements with the real world. Lucasfilm released a video today showing off just how the company's technology can superimpose realistic looking droids in your living room. 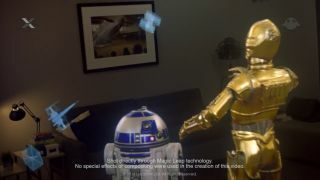 In the video, we see C-3PO and R2 navigate through a living room without bumping into furniture. R2 then projects a hologram of stormtroopers raiding a village on the coffee table and then projecting a dogfight between X-Wings and TIE fighters in the air. It's all incredibly realistic and shows how sophisticated Magic Leap's technology is. In the video, R2 is able to display a hologram on top of a table, which means the technology can accurately track and identify objects inside a room. There's a disclaimer at the bottom of the video which reads, "Shot directly through Magic Leap technology. No special effects or compositing were used in the creation of this video." Magic Leap and Luscasfilm aren't talking specifically about what mixed reality experiences they're working on, but there's speculation that we could have C-3PO as a virtual reality assistant, giving a face to our currently faceless digital assistants like Siri and Cortana. It sounds a bit gimmicky but I'm excited to see what they come up with. The partnership between the companies includes the creation of a secretive lab in ILM's headquarters to work on Star Wars projects. Skywalker Sound is also on board to bring immersive audio to the experience. "We want to be a medium how to tell stories—and ultimately, maybe the medium," said Magic Leap founder Rony Abovitz speaking to Wired. Magic Leap isn't the only company hoping to bring augmented reality (AR) to the masses. Microsoft is heavily investing in AR with its HoloLens headset, which may change how we watch football in the future. Nintendo's upcoming Pokémon Go mobile game also utilizes AR to bring Pokémon into the real world. We still don't know when Magic Leap will launch a consumer product but it's exciting to see a huge production company like Lucasfilm collaborating with the startup.